Yes, readers; if you are not a football fan, never fear. There is no need to glaze over and stop reading. 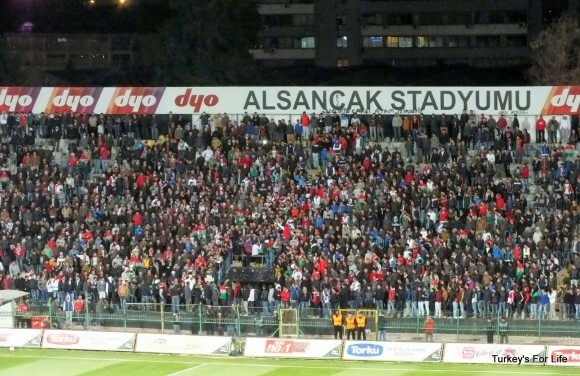 This is not so much a match report as another tale of the under-prepared travels of Barry and Julia; it’s just that the setting happens to be a football stadium – Alsancak Stadyumu – and we happened to be at a football match – Karşıyaka v Fethiyespor. 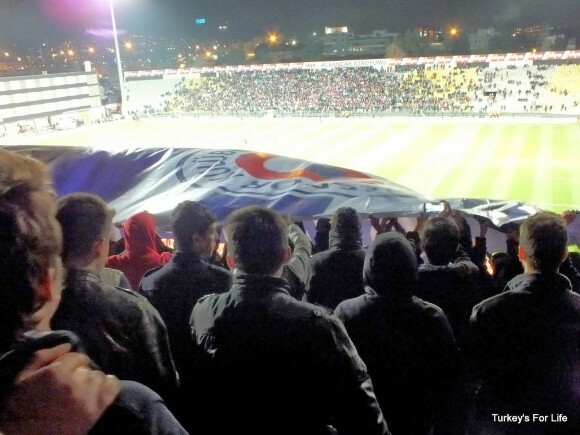 If you remember a while back, a few of us came up with 15 fantastic reasons to support Fethiyespor and reason number 12 is about travelling Turkey. Well, we’ve been looking for an excuse to return to Izmir for some time, so we decided our first away match would be the match against Karşıyaka. And, rather than go up on the supporters’ buses and return on the same day, we decided to stay for the weekend, thus enjoying the fabulous surroundings of our opposition. We booked an apartment in Alsancak, thinking we could take the ferry to Karşıyaka on match day. 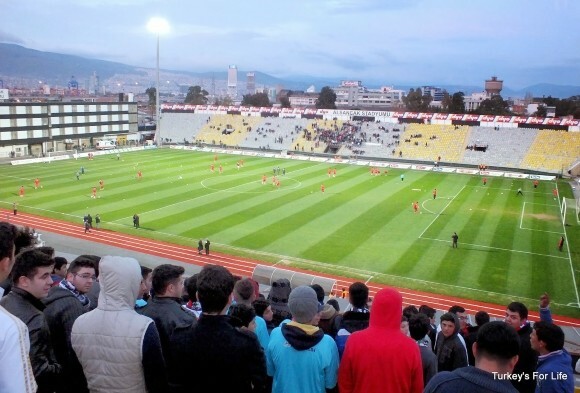 As it turned out, the match was to be played at Alsancak Stadyumu, right around the corner from our apartment. Bonus! On the morning of the match, we thought we’d better check out the stadium – after all, we were the away supporters and knowing where to go to join up with the other arrivals from Fethiye would be useful. Sounds very organised of us, doesn’t it? Well, apart from getting this photo (above), that was a useless exercise. Signs pointing in directions they shouldn’t have been pointing in and not a soul around to ask. It was a dull day and a cold Aegean wind was blowing. We decided to worry about it at match time and went to find a bar with heat instead…finding warm bars in Alsancak is a much easier exercise than checking out the local football stadium. However, I did notice one thing: in my life I’ve spent more than enough hours in the freezing cold rugby league stadiums of deepest darkest Lancashire and Yorkshire to be able to spot a cold stadium when I see one. And here’s Alsancak Stadium on a dull windy day, high curved stands, no roof, completely exposed to the elements…and the Aegean Sea is just a few hundred metres to the right of the photo above. Evening kick off. This was going to be a cold one. We stopped off at our apartment en route back to the stadium for the match. Layers were necessary. Long-sleeved t-shirt first, woolen clingy jumper second, polartec microfleece jacket third, thick Fethiyespor sweatshirt last. That should just about cover it. 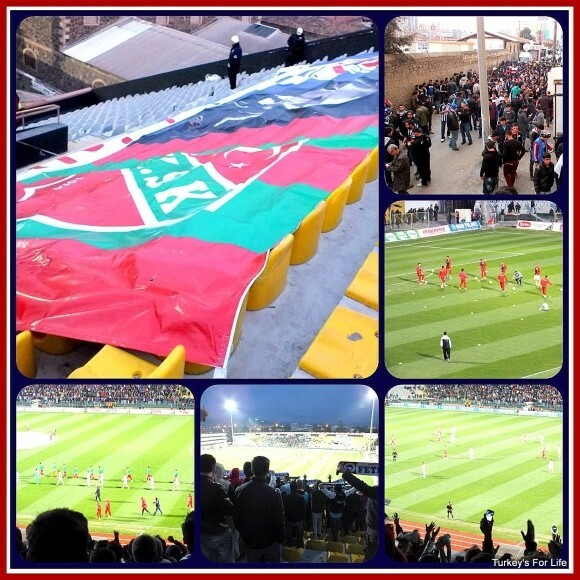 We got to the stadium and spotted a couple in blue and white scarves…stood right outside that stand in the top photo…that stand that backs onto Alsancak train station and the Aegean Sea just beyond. Yep, we were all going to be cold, tonight. Drums and chanting to our right. Looks like the buses from Fethiye have arrived, then. Seven buses for this match – quite impressive for a Sunday night. We say hello to a few people we know and we all head up the steps, show our tickets and we’re in. This stand is higher than it looks from the outside…and windier, too. And then we remember our blog post where we described Izmir as Turkey’s windy city. We loved the wind, then. It was fresh and breezy and summery. Tonight, it’s fresh and wintry and there’s no escape from it. In typical supporter style, most of the younger Fethiyespor fans have set off from a comparatively warm Fethiye in their Fethiyespor shirts, a long-sleeved top underneath and a hoodie if they’re lucky. Scarves soon become makeshift wraparound hats. I often look at the younger bunch in Fethiyespor’s stadium and think, “He must be cold,” (yes I know that’s a sign of getting older and being more sensible) but tonight, I can see they are cold. I don’t think any of us were really expecting this. Jumping up and down and singing would warm everyone up, hopefully…and they did try…me and Barry just clung onto each other, muscles rigid. We were past trying to move about. We picked a good match for our first away match. The Karşıyaka supporters know how to make a noise. One of the reasons I love going to matches is because I’ve always had a bit of an obsession with stadiums and stadium noise – one of those things that makes you shiver, in a good way – and Karşıyaka do that really well. No idea if Fethiyespor supporters are so noisy – you can’t really tell when you’re in amongst it – but there’s no shortage of effort tonight, despite the cold. In the last minutes of the match, the Fethiyespor-Atatürk-Karşıyaka banner that throughout the match has been both proudly displayed and used as a shelter for a few supporters who felt the need to huddle under it for a while against the rear wall (we pondered joining them at one point) is once again unfurled and we pass it over our heads. We can’t help but feel a sense of relief knowing this signals the end of the match – well, Fethiyespor are also 2-1 up and we need it to stay that way. The referee blows the whistle. Three very necessary points for the Fethiyespor team – happy days! We leave the ground, still huddled, heading straight for any Alsancak bar that looks warm, We don’t envy all the other supporters with their few-hour journey back to Fethiye – hats off to them for coming all this way. Within minutes, we’re in said warm bar, muscles hurting as they slowly thaw and relax back to normality, and we order two beers. “After what we’ve just done, most normal people would have ordered a hot drink.” says Barry. I know exactly where you are talking about. We stayed just around the corner and met our car rental guy at the Alsancak Train Station. Didn’t realize at the time it was a football stadium next door. The bars were all flowing out into beer gardens and enjoying the outdoors when we were there in September. Don’t envy you the cold stadium.